A couple of months back, I wrote a short post about a Malaysian project that was successfully funded on kickstarter. Today, I can proudly say that Malaysians continue to surprise me in untold ways. 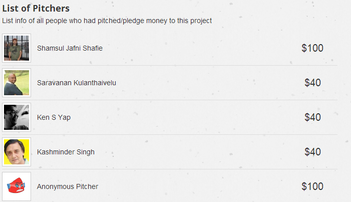 Pitchin.my is the Malaysian kickstarter, and recently it saw a successful funding of a project on it’s website–that literally brought tears to my eyes. The project entitled “Sponsor a Child to Read” was done by an English teacher from a rural school in Negeri Sembilan with a small-ish goal to raise a relatively small-ish USD3000 to provide books to 30 students with low literacy level from SMK Teriang Hilir. Let me tell you, there’s nothing small-ish about teaching 30 students. Located in a rural village in Negeri Sembilan, a lot of my students come from an environment where education is not highly valued, especially not at home. From this project, I hope to increase their literacy rate by providing them access to books and by creating a learning environment in their homes. Once a week, a reading session will be held in the local town hall where the 30 students AND their parents will attend. They will be given books to read and will then bring those books home to add to their home libraries (currently, the selected students have less than 5 books at home). In the weekly reading sessions, these students and their parents will engage in interactive reading activities that will both be educational and motivational. The money raised will be used to buy 750 English books (25 books per student). These books are selected based on their level of rigor and will be tailored to each child’s current reading level. It is hard to change the life trajectories of children whose paths have been determined for them based on their existing environment. The students involved in this project are mostly at least 4-5 years behind their grade level. I truly believe that the only way to break this cycle of illiteracy is by providing them the access to books and involving their parents and community as well. The project was successfully funded (101% as of now), which means Liew would get slightly more than he initially planned for. More importantly, these rural students will finally be able to access proper reading material thanks to other Malaysians (and probably foreigners as well). What’s more heart-warming is to know, that the list of supporters for the project looks like a fictional put together list from the moral textbooks of yesteryear–every race, every creed and every gender, except this wasn’t a fictional story with a moral at the end–this was REAL LIFE and it just goes to show Malaysians will come together to help our fellow Malaysians. A lot of pitchers were also anonymous–well in line with the Malaysia spirit of “not letting the right hand know what the left hand is doing”. Like I said, Malaysians continue to surprise me in untold ways. What’s even more surprising is that almost 20 Malaysians gave more than USD100 (which is a pretty hefty sum of cash if you ask me). Congrats Liew Suet Li–Malaysia needs more people like you!! Get more news on the project from the pitchin website here.